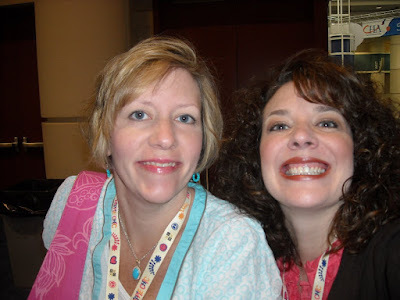 OK...it was actually day three at CHA but it was only day one for me and Julie!! We had a rough ride down to Florida, which started with a three hour flight delay (spent sitting on the runway). Yes, I just said three hour delay, in a plane...do you know what it's like to sit in a tiny airplane seat when you're seven months pregnant? Me either, but poor Julie had to sit there, right along with the other 150 passengers that were jam packed into our airplane. After all was said and done we were in either a bus or airplane for 11 hours with only a pack of peanuts for dinner. Whew! Folks...sometimes it might be easier to drive! Thankfully, we arrived to a lovely hotel room and were able to get a restful night's sleep. (They even had a fan in our room...aaahhh...anyone else unable to sleep without a fan? Look, I said I had issues...) Let's start with a few celebrity photos...First up is Ms. Kim Crawford! This is the first time I've met Kim, although I'm familiar with her beautiful work. I also got to meet for the first time, but didn't have the guts to scream, tackle them to the ground, and demand their autograph and photo (I just wasn't up for a trip to the local jail today), Taylor, Beate, and a whole bunch of SCS, MFT, and Unity girlies. 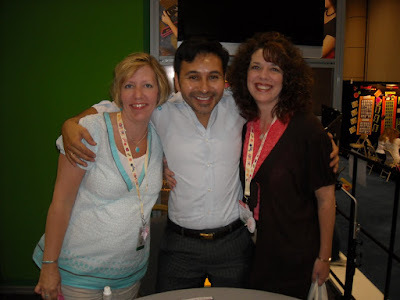 It was very exciting for a New England girl who doesn't get out much these days... And then, who knew that Mark Montano (he used to be on TLC's "While You Were Out") would be at the show. We received a free autographed book! Ohhh...Julie and I are on the verge of stardom! We also sat for a Tim Holtz make 'n take but...I don't have a picture with him...which is too painful for me to talk about right now... Here are a few of my favorite projects from our talk through the show... 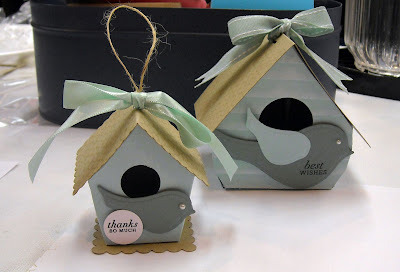 Darling houses created using Basic Grey papers...ohhh...aren't they fabulous! Don't you want this totally funky lamp in your living room? Amazing stuff from Hambly Studios. 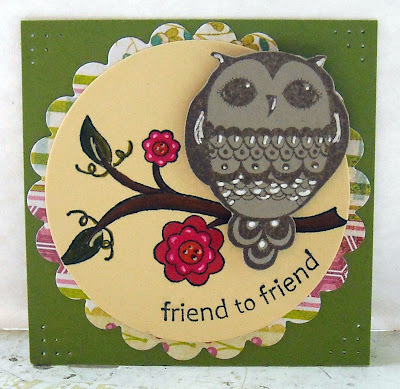 Julie and I were both ga-ga over this darling owl embossing folder from Chuttlebug. 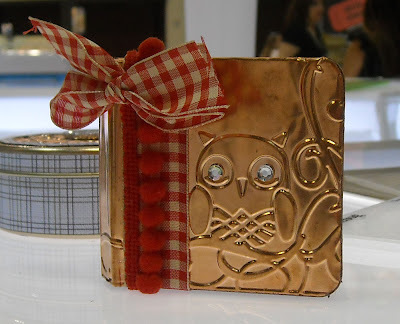 And how cute is in this copper colored tin? 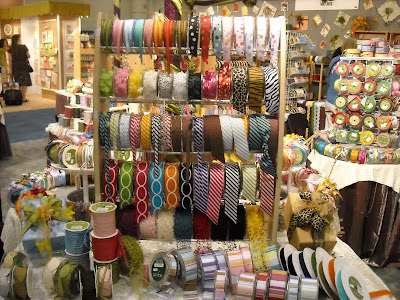 You know I'm buying this folder... Oodles of ribbon from May Arts!! I was drooling... 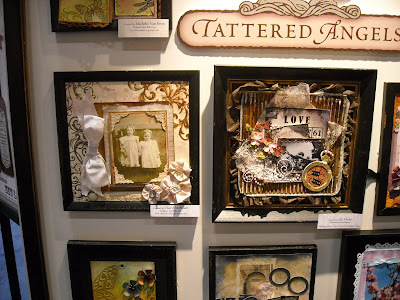 I had never heard of Tattered Angels but oh baby...this is my style! 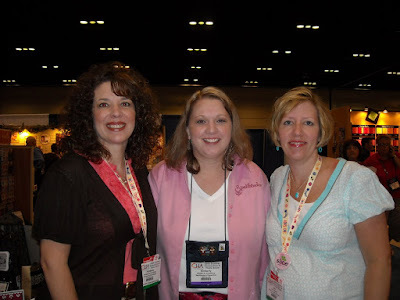 I loved their products! How's this for a Keep it Simple project, divine! Edited: This adorable project is from the October Afternoon booth! Love their papers! And...ok...even though Tim Holtz didn't take a picture with me (I mean, doesn't he know who I am? ), I'll post this fabulous project from his booth. (I still love you Tim...even if you did shun me...) I have so many more photos to share but I'll take a break for tonight. Tomorrow we head out to the Craft Super Show, where we can purchase products...Oh boy, we're gonna be in trouble... Back later!! OK, I'm loving this simple style! Why just today I finished two cards in under an hour...does anyone understand what a miracle that is?? I'm pretty sure I heard angels singing when I tied the knot on my second card... Today, I got to play with my new Papertreyink Button Bits stamp set. I LOVE this new set, it is so darn cute. Check out that little chickie...darling! Nichole has added two different wings, along with two different size chickies. This is definitely one of my all time favorite PTI sets. I only needed to stamp the beak, tail, and feet, add a button, a rhinestone for an eye, and the wing. Piece of cake! Since the main portion of the card contained all of the bells and whistles (image, sentiment, and ribbon), I kept the rest of the card fairly plain. I did stamp a stitched background (from SU!) on the blue cardstock, using my new PTI snow white ink...another favorite! 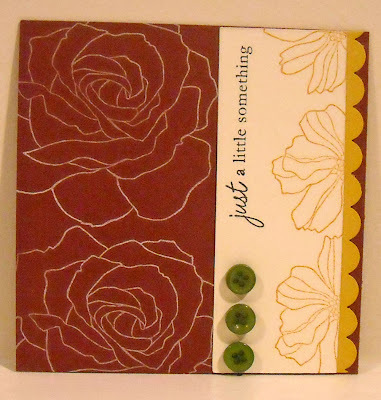 All of the cardstock used is also from PTI, along with the ribbon and button. And I confess, I think PTI is going to be my new paper supplier! I love that you get free shipping once you spend $50 and come on ladies, how hard is it to spend $50 on stamping supplies! Ca'ching! Well I have a busy night ahead of me tonight so I'm off...Have a wonderful evening! Today's Tip: Don't stress!! 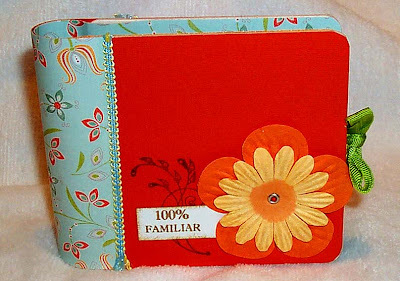 OK, that's a reminder for me...Your tip is to forget the solid stamps, pick a pretty outline stamp and two coordinating ink colors to create your own patterned paper. Let's look at what it took to create today's simple card... Start stamping on Saturday afternoon Check out some stamping magazines for inspiration Find a fun layout and get to work Use the Cuttlebug to cut six small circles, stamp an image on the circles, color image with Copics Assemble card Decide color is all wrong Throw card in the trash Resume stamping on Saturday evening Decide to try first layout again but with different images Get mildly excited at initial results Attach all of those tiny circles to card base with dimensional tape Add ribbon Stick out tongue in disgust Throw card in the trash Decide to change direction Pull out new PTI stamp set, Every Day Button Bits Get very excited over darling bike image, stamped in brown ink on cream cardstock Dig through 700 million buttons to find ones that work for the bike wheels Color bike, add sentiment Stare at finished piece Throw card in the trash Feel like giving up and never stamping again Put head on desk and sigh deeply Decide to forget the card and just play with my new PTI snow white ink and new SU! paper Squeal when picking up stamp to see how beautiful PTI's snow white ink looks on dark paper Have a light bulb moment Grab the left over cream cardstock, misc. 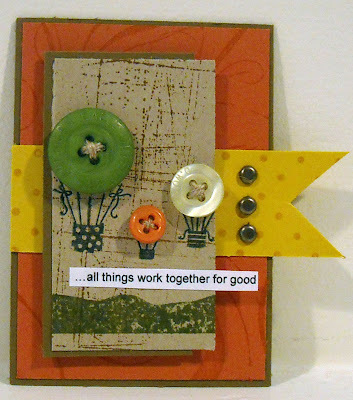 buttons lying on desk, and sentiment from PTI set Create a scalloped strip of paper Assemble card Smile from ear to ear Decide to stop stressing so much about creating and just Keep it Simple!! May your card making this week be filled with less stress and more fun! Today...gasp...I went to a petting zoo. That's right, I communed with nature. I touched a sheep, fed a goat, and snuggled a pony. Whew...someone stop me, I'm on the verge of embracing this whole New England lifestyle! Before you know it, I'll have chickens in my backyard... :-) We finally had a beautiful sunny day, without torrential downpours, so we decided to take the munchkins to huge farm near our home. 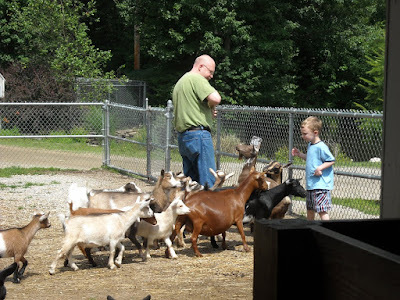 In addition to taking a tractor and horse drawn carriage ride, we saw mountain lions, camels, wolves, and goats...to name a few of the animals at the park. (Oh, and there were bears...bears...you know those big, giant man eating animals? They freak me out...I won't hike because I'm convinced the bears will smell my fear and attack. I'm glad they were behind bars...right where they belong!) Here are a few snapshots from our day... This was it for excitement for our youngest...he had zero interest in the animals but talked non-stop about the tractor. 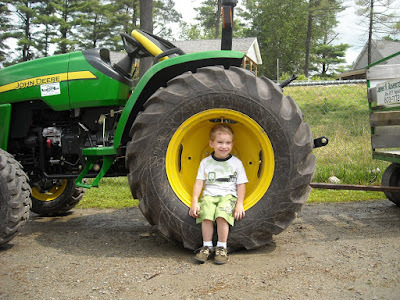 He almost burst when he was allowed to sit on the tractor. You've never seen such joy. 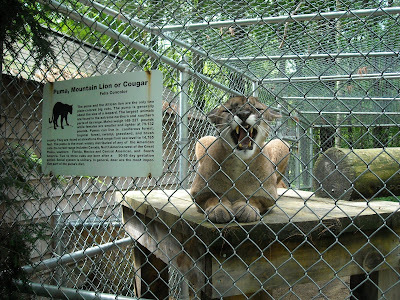 This wasn't a yawn, it was a snarl. This cat, about three feet away from us, walked over, eyed my sweet pea, put her ears down, and let out quite a snarl, followed by a growl. Let's just say, I'd die of a heart attack if I ever saw one of these on a trail. 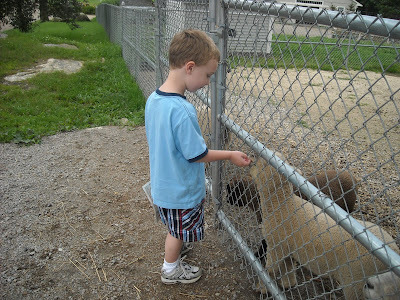 My brave child, petting the lambs, which were soooo cute. I wanted to take one home... He wasn't all that sure about the goats attacking him for food but he held his ground and did ok. The youngest, screamed "I wanna get outta here!" (And he was on the other side of the fence..the one minus the goats.) 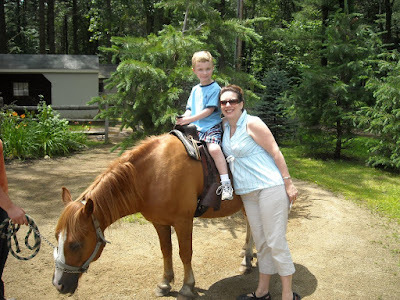 Our oldest even braved a pony ride, without blinking an eye. The youngest? Yeah...when I asked him if he wanted a pony ride he replied, "I wanna get outta here!" 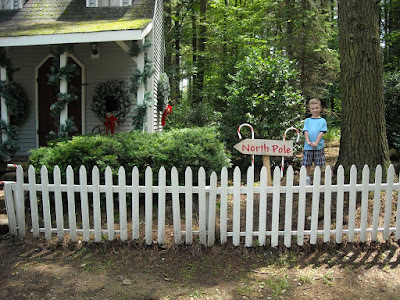 When we walked by this little house my brainy boy loudly exclaimed, "I found the North Pole, I found the North Pole! I didn't know it was this close!" Ahh...that homeschooling is working wonders... 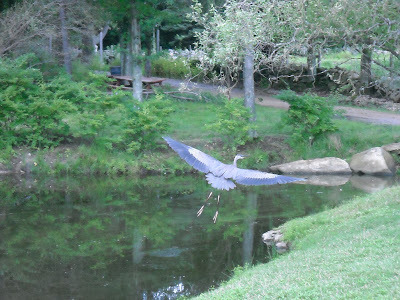 This was pretty amazing...a blue heron flew in right over our heads and we were able to get without two-three feet before she took off again. Very cool...We used to live on a lake and had these in our backyard all the time. Amazing birds... Finally, at the end of our stay, on the horse drawn ride, our little one quietly said, "this is fun..." Not that he looks like he's having much fun in this photo...he was shy about some strange man taking our photo. Poor boy...takes after his mother...we'll have to work on that... :-) Hope your Saturday was lovely and sun-filled...be sure to check in tomorrow for a Keep it Simple Sunday card! It's good to be back on track and posting a SALT post, which I missed two weeks ago because of all the prep involved in getting ready for Stamping Around. This week it was Nikki's true to set the challenge and she chose one of my favorite verses, Romans 8:28, which reads, "For we know that all things work together for good, to them that are called according to His purpose." This verse has been so comforting when I've gone through difficult times in my life. It's the one that always comes to mind when I feel discouraged by what seems to be impossible obstacles or hit with a grievous situation. Sometimes it can feel as if God is no where to be found and yet, without fail, I have always found that all of my hardships have ultimately been for my good. In my Bible, the heading over this section of scripture is "From Suffering to Glory" and here are a few key verses that I read tonight that are so encouraging and worth sharing...(all from Romans 8) -v. 18 - "For I consider that the sufferings of this present time are not worthy to be compared with the glory which shall be revealed in us." -v. 26 - "Likewise the Spirit also helps in our weaknesses." -v. 30 - "Moreover whom He predestined, these He also called; whom He called, these He also justified; and whom He justified, these He also glorified." -v. 31 - "What shall we say to these things? If God is for us, who can be against us?" -v. 38 - "For I am persuaded that neither death nor life, nor angels, nor principalities nor power, nor things present nor things to come, nor height nor depth, nor any other created thing, shall be able to separate us from the love of God which is in Christ Jesus our Lord." We can rest assured that if we're trusting in Christ, we may go through the deepest waters here on earth but we may experience the greatest blessings in heaven. I pray that thought would remain in your (and mine!) minds, and your eyes would remain fixed on Christ, as you continue your journey through this life. Stop by the SALT blog to read Nikki's excellent post about what this verse has meant to her through her life. I also want to note that this will be Nikki's last post with the SALT team. She and her family are in the midst of a big move and she needs to take a break from her design team activities. We have so enjoyed her contributions and will be praying for them to have a safe move. I hope you enjoy the wonderful creations posted by our design team! If you feel inspired to make your own card or scrapbook page based on this week's theme, please drop us a note with a link back to your blog or gallery - we'd love to share! PS - I really need some scripture stamps...anyone have suggestions on a good stamp vendor? PSS - How about those new Papertreyink button stamps! WooHoo!! I'm stamping a lot, really I am...It's just that I'm stamping lots of projects for publication in the next issue of Scrapbooks News & Review so I can't share yet! :-) This is a project I created for a class I taught at Wholly Scrap about two years ago and I'm hoping that I haven't posted it here before! 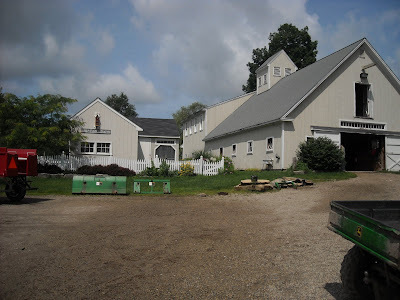 (I'm going to be teaching at Wholly Scrap again soon so keep checking back in for a schedule.) 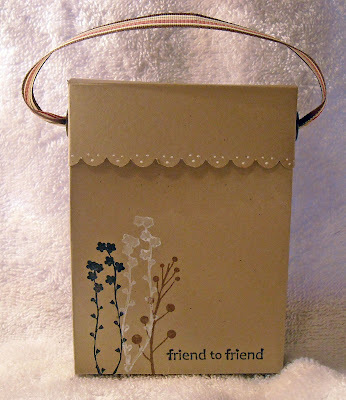 This is a chipboard album, created using a tutorial from Nichole Heady. 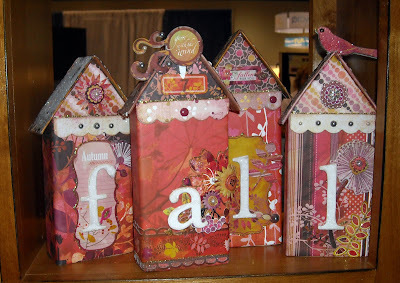 This is a super easy project and so cute! 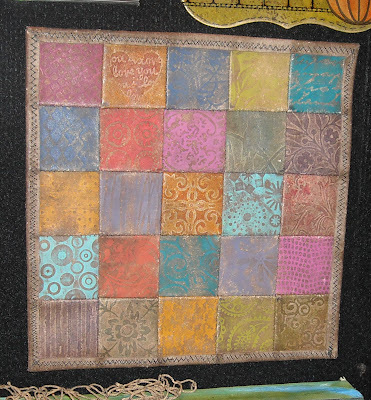 My chipboard pieces were 4" x 4" and I was able to add eight photos and four panels for journaling. 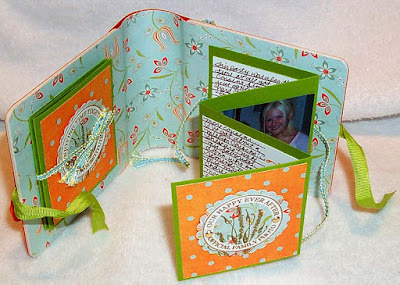 I'm not a huge scrapbooker but I adore these mini albums! I have a pile of them waiting for me to finish...I just need about two solid weeks alone in my stamping room...yeah...I'm thinking that's not going to happen for at least 18 more years! Enjoy and be sure to check out Nichole's blog, she's provided excellent instructions on this project! Oh, and check out the Stamping Around site today, Julie has posted some great info on one of our supply sponsors - eclecticPaperie! Sonia over at Scraps 4 Fun left me this wonderful award! Thank you Sonia! Sonia is super talented and super sweet so please hop over to her blog and check out her beautiful work...and leave her a nice comment! 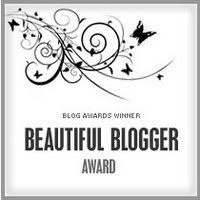 I'm supposed to create a list of folks to pass this award along to but I think I'll just direct you to my "Blogs I Read" section, on the left hand side of my blog. I don't keep a very long list but it's packed with talented ladies! Take a look...and enjoy! I think I'm finally back in the groove after being at the Stamping Around CT event and am starting the week with a Keep it Simple card! This week's card is a tribute to one the teachers who will be at our Vermont event...Jenn Shurkus! 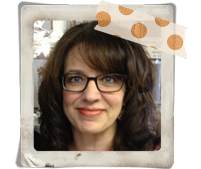 Jenn is a teacher for A Muse stamps and I can't wait to take her class! I only have one A Muse stamp set so I definitely need some practice! 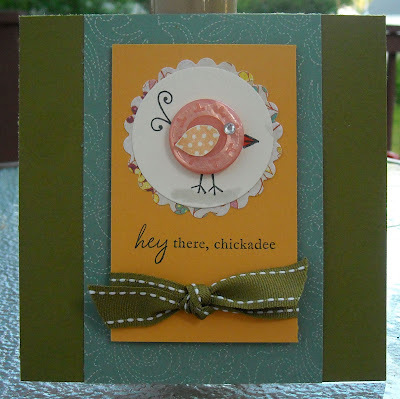 My card features images from my one set, Animal Wishes, a darling little bird and sentiment. This little card, a mere 3.25" x 3.25", was created in minutes! (I liked it so much that I want to make an entire set of cards using this set!) The wee bird was stamped three times on white cardstock, then three more times on a second sheet of white. 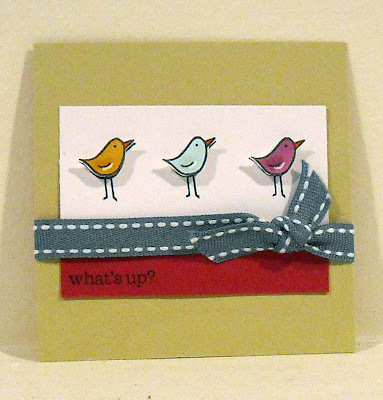 On the second sheet, I colored in each bird, cut them out, and attached them to my card, using dimensional tape. 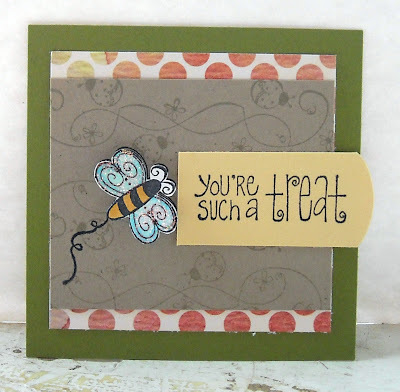 The sentiment was added in black and a ribbon finished off the card! Enjoy!! Last month I participated in an image swap with some of the girlies on the Scrapbook News & Review group and this is one of the over 100 images I received! Isn't that amazing? I had such a great time looking at all of the images last night. Fantastic! There were some images included that I've never seen before and I can't wait to start creating! 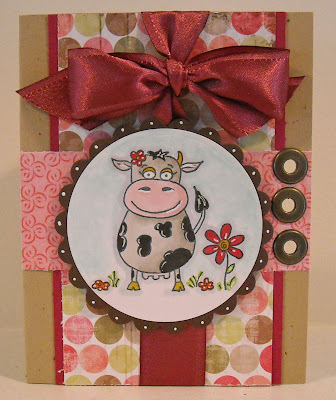 When I saw this cow image I immediately knew I was going to make a card for a friend of mine who loves cows. She's had a difficult week and I thought she might enjoy a little giggle from seeing this cute bovine character. :-) You'll notice that I've once again pulled out the kraft cardstock...somebody stop me! My original thought was for a different color but I was sucked back into using kraft. It's really just so fabulous with everything! 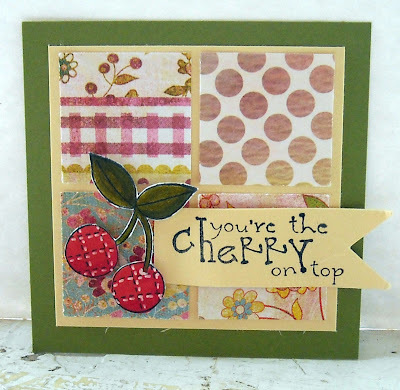 The cute polka dot paper is from Wholly Scrap and was something I picked up a few weeks ago. All other supplies are from Stampin' Up! (Notice that I just couldn't resist adding a small dot with my white gel pen in each scallop around the cow...I just can't leave a scallop alone!) 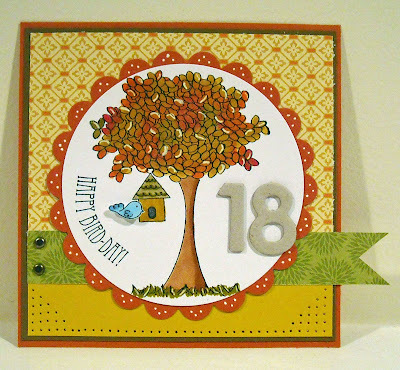 Oh, and this layout is from this week's Splitcoaststampers sketch challenge... Enjoy! I can't stop using kraft cardstock and a white gel pen! I love it! For this card, I even dragged out the white ink! 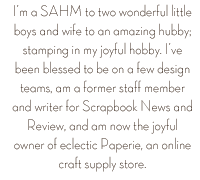 (PS - I used Paptreyink's white ink pad while at the Stamping Around CT event and it is divine! Go get yourselves one of those juicy ink pads...I know it's on my wish list!) This card is based on this week's Mojo Monday sketch, although it's now a MoJo Wednesday. Oh well, I did make the card on Monday evening, if that counts. :-) I love the the Mojo sketches, they're amazing! 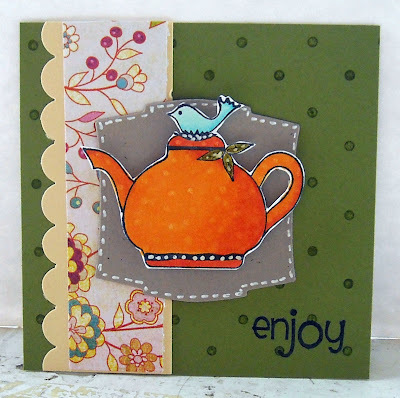 All images used are from Unity Stamp Co., my new fav stamp manufacturer. 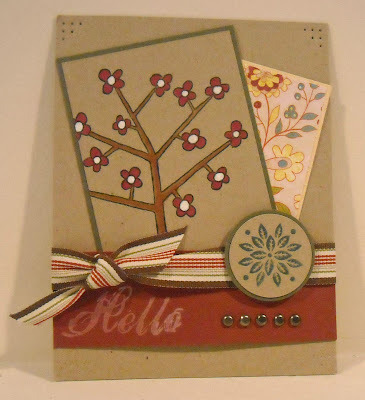 That little peek of patterned cardstock is from Basic Grey and my other cardstock and accessories are from Stampin' Up! Enjoy!! Labels: basic grey, stampin' up, unity stamp co. 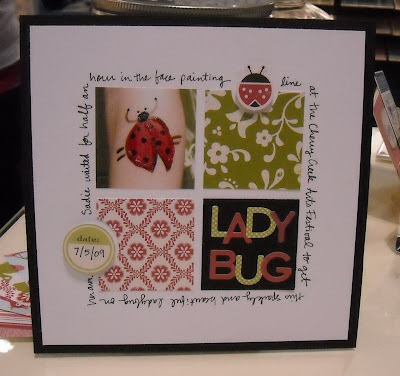 I have returned from our Stamping Around Connecticut event and finally feel rested! We had so much fun!! I can't even express how exciting it is to meet so many people in person that until this weekend we only knew through email or blog posts. Our attendees were wonderful, the instructors brought us amazing projects, and our sponsors rocked our event with a boatload of door prizes! 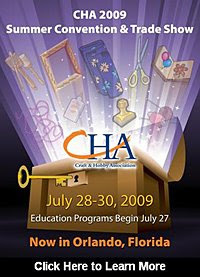 For today, I'm posting my project, which was sponsored by Unity Stamp Co. Can I tell you how much I love Unity stamps and I was overjoyed that they sponsored my class! I was able to give away a number of their sets and the winners were thrilled! My class consisted of a mini box, which held four mini cards (3.25" x 3.25"). We got to use our Copics and white gel pens (my new fav medium) and explore a number of blending techniques and fun tricks using a colorless blender pen. 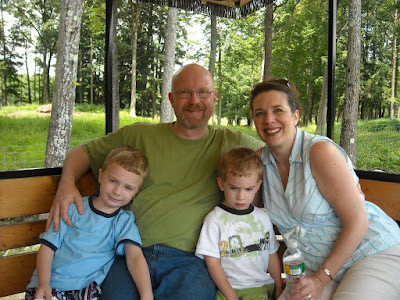 In other very exciting news...Our new web site, www.stampingaround.com, is live! You can check it out for details on the design of our site, more photos from our CT event, and information on our upcoming events! Enjoy! 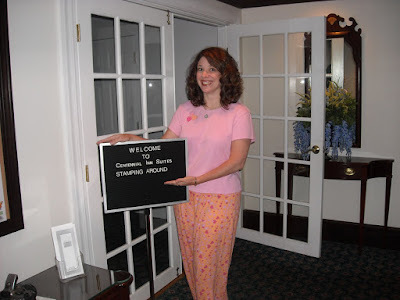 Julie and I are safe and sound in Connecticut and are just back from our very first "Stamping in your PJs" class! It was a blast and wonderful to meet our attendees and catch up with old friends! Check out the cute welcome sign the hotel put out for us! 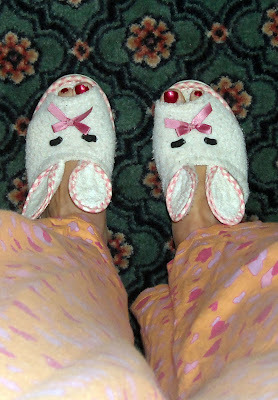 Here's my best Vanna impersonation...while sporting my "in public" PJs! Stay tuned for more pictures from our classes tomorrow...WooHoo, we are having a blast, which you were here!